GetLinked® Software Forum • View topic - What versions of Intuit QuickBooks does GETLinked Software work with? What versions of Intuit QuickBooks does GETLinked Software work with? Post subject: What versions of Intuit QuickBooks does GETLinked Software work with? GETLinked Software works with all current Windows versions of Intuit QuickBooks, Desktop (including Enterprise) and "Online", "Cloud" or "Hosted" (GENERAL LEDGER ONLY) editions including the latest version. NOTE THAT SOME ONLINE SERVICES HAVE EXTRA CHARGES WHEN USING ANY 3RD PARTY INTERFACES. Make sure to contact the company that is hosting your QuickBooks and know all the charges for setup, installation and ongoing maintenance fees. We cannot tell you what additional fees could be charged by the QuickBooks hosting company or if their configuration will require additional time and charges on our end. All versions are contained within GetLinked software and are configured in the setup windows under System, Model and Version. You will not have to purchase a new subscription for different versions of existing systems we interface. To see if your specific version is supported please visit our Store and choose QuickBooks from the Transfer System dropdown list. You can then choose the Model and Version you are looking to purchase. If you do not see your system click on our web site under Site Map > Contact Us and tell us what you need. You can also send a message to us at Sales. GETLinked Software interface for QuickBooks Payroll is to QuickBooks Desktop version. Intuit provides links from their QuickBooks Desktop version to some of their "Online" payrolls. Please contact Intuit directly or authorized dealer for the interface between the two Intuit software products (ex. QuickBooks and Online Payroll). 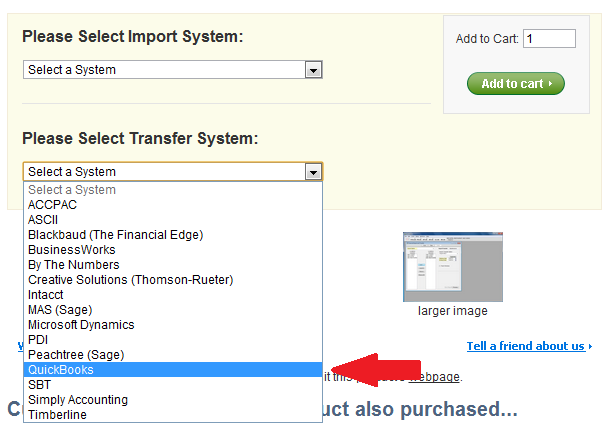 Make sure to confirm the interface you have with Intuit prior to purchasing an annual GETLinked Software Subscription.